In an effort to find my lost salad mojo, I’m making a different salad every day for a week. The reason for the salad: A recent weight gain that I blamed on blogging but which was really caused by my lack of salad eating (and exercise). You see, I’ve been bad, really bad. I’m supposedly following the Eat to Live program which, in a nutshell, says to eat lots and lots of veggies, lots of fruit, some beans and nuts, but no refined grains or other processed foods. So bread is a no-no and salads for lunch are highly recommended. I was doing fine until recently, when I started getting cravings for sandwiches, and my lunchtime salads were all but forgotten. I may not follow Eat to Live perfectly (low sodium is hard for me), but when I stick to salads for lunch, I feel better, have much more energy, and–if I eat right the rest of the day–I lose, rather than gain, weight. On Monday, I asked for salad ideas, and boy did people respond! Thanks for all of your suggestions, both in comments and in private emails. Feel free to add as many as you like. Today I’m using two suggestions. 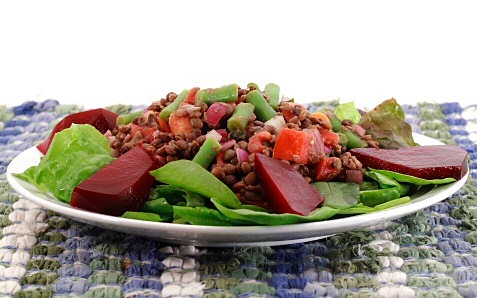 First, I liked Cristy‘s recipe for her Mum’s puy lentil salad as soon as I saw it. Since she didn’t suggest amounts, I made it how I thought I’d like it, and wow is it good! 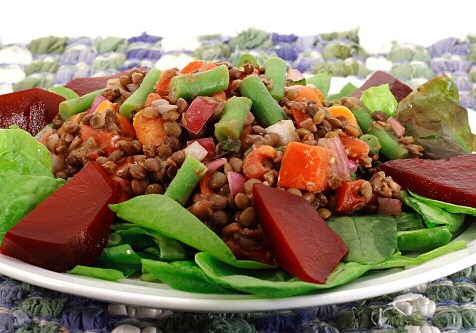 In fact, just the lentils cooked with onions and herbs tasted so good that I almost ate them alone, but in combination with the other ingredients they make a true dinner salad. I put Cristy’s salad on top of some spinach and red leaf lettuce that I drizzled with a little red wine vinegar. Then I incorporated another reader’s, SCS, suggestion to use roasted beets. They were also tasty (though I had trouble finding decent beets in my town). Thanks to both of you for these great ideas! In a medium-sized saucepan, sauté the onions until they’re translucent. Add the garlic and cook for a couple minutes more. Then add the lentils, water, thyme, and sage. Bring to a boil, then reduce heat and cover. Cook for about 30-40 minutes, until lentils are tender. Add the green beans and salt, if you want, and cook for 5 more minutes. (You may also add the carrots at this time if you want them slightly cooked rather than raw. ) Remove from heat, drain (and save) the cooking liquid, and place the lentils in a large bowl. Add the remaining ingredients and combine well. If it’s a little dry, add some of the cooking liquid to the salad. Add more vinegar as needed. Refrigerate and chill well before serving. Makes about 4 servings. Cristy, I apologize in advance for any misrepresentation of your mother’s salad. Thanks again for the idea! Wash and scrub beets well. Wrap each beet in aluminum foil and bake at 350 F for about an hour. (I did this in the toaster oven with 2 beets, and it worked well.) Allow the beets to cool, and then peel them and slice or dice them.